Vietnamese Prime Minister Nguyen Xuan Phuc said his country will “spare no effort” to host a successful summit between North Korea and the United States because in the end, it would be less costly than a war.”For the peace of the world, for a connected and developed world, let’s shake hands. We shall develop together and contribute to global stability,” Nguyen told CNN. In an international exclusive interview with CNN, Nguyen — the second in line of Vietnam’s ruling Communist Party — said that the country hopes to play more than just host to US President Donald Trump and North Korean leader Kim Jong Un, but rather prove itself as an example of the benefits of peace, reconciliation and market liberalization. Kim arrived in Vietnam Tuesday after a two-and-a-half day train trip to the country. He was welcomed by Vietnamese officials and a guard of honor in the border city of Dong Dang. Kim then got into his Mercedes and headed to Hanoi, where he will meet Trump Wednesday and Thursday. Trump arrived in the city Tuesday night. The country is expected to reap some economic and public relations benefits by hosting the diplomatic event, and it is openly embracing its role as host. North Korean, US and Vietnamese flag displays can be seen throughout the city, and its vendors are selling shirts emblazoned with Kim and Trump’s faces in addition to their usual fare. 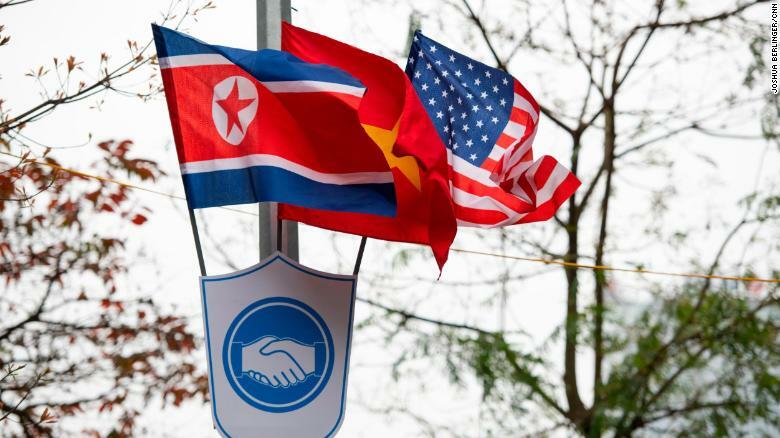 The flags of Vietnam, the United States and North Korea on display Sunday near Hoan Kiem Lake in Hanoi on Sunday. Nguyen said Vietnam’s war-torn history is an important motivator in hosting the event: “Vietnam is doing her best to successfully organize the second US-DPRK summit in Hanoi. It’s a historic moment in the path toward reconciliation and peace-making on the Korean peninsula. That is a very important commitment and responsibility for us.” The prime minister added: “We deeply appreciate the meaning of peace and reconciliation. Contributing towards peace is a responsibility of each nation in this day and age.”Vietnam is believed to have been chosen as the host of the summit for both practical and symbolic reasons. The country is accessible by train from North Korea and maintains diplomatic relations with Pyongyang. Kim visited his country’s embassy in Hanoi shortly after arriving in the Vietnamese capital. But Vietnam also is a powerful symbol for those trying to sell North Korea on giving up its nuclear weapons in exchange for US help to develop its economy. Hanoi has undergone a “remarkable” transformation, as the World Bank puts it, since embracing market liberalization in the 1980s without ceding political authority. The Trump administration is expected to try to convince Kim to embrace an economic model similar to Vietnam’s, but it’s unclear how receptive Kim will be. Vietnam’s changed relationship with the United States is another point of pride that Nguyen said he hoped North Korea could find inspiration in. The prime minister had close family fight and die in the war against the United States. When asked about his personal experience, Nguyen demurred. He said it was important not to dwell on the past.”We don’t forget our past, our history, but we need (closure) in order to look to the future. We need such mutual understanding to build our nations in peace, to better solve the problems in the lives of our citizens,” he said. 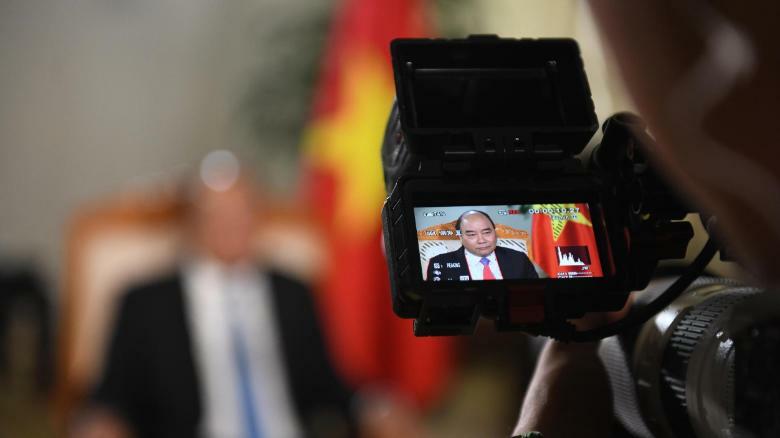 Prime Minister Nguyen Xuan Phuc in an interview with CNN February 26. Nguyen did not spend much time discussing the points of contention between Vietnam and North Korea, and appeared to play down tensions with Pyongyang over a Vietnamese citizen’s alleged involvement in the killing of Kim’s half-brother, Kim Jong Nam in Malaysia in February 2017. South Korea and Malaysia blamed North Korea for the killing, which Pyongyang vehemently denies. Two women, one Vietnamese and one Indonesian, are on trial for the crime. When asked about reports that North Korean officials “expressed regret” that the Vietnamese woman was charged, the prime minister avoided the topic.”This is an issue of the law. We also care about protecting the rights of our citizens, but both countries will discuss this specifically at a later time, not during this period,” he said. The Vietnamese woman accused of the crime, Doan Thi Huong, claims she was duped by North Korean agents.